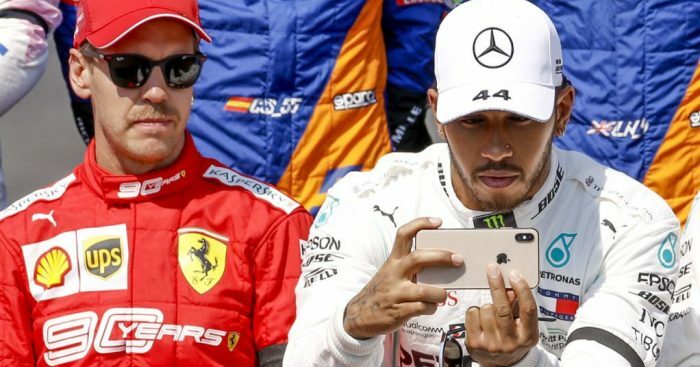 Sebastian Vettel reckons the only reason he even got close to Lewis Hamilton during the Australian GP was because the “bored” driver was “playing” around. Last year’s title protagonists, both Hamilton and Vettel had a Sunday to forget in Melbourne. While they started first and third on the grid, neither had the pace to challenge for the win. Hamilton was overtaken by Valtteri Bottas into the first corner and spent the entire afternoon running second as he complained about his tyres and lost over 20s to his team-mate. As for Vettel, he looked to have closed the gap to Hamilton as the pit stops played out only to slowly but surely drop off before he was passed by the Red Bull of Max Verstappen. Vettel reckons given his own balance issues, the only reason he even got close to Hamilton at all was because the Brit was “bored”. “I don’t know what Lewis was doing,” Vettel said after the grand prix. “I was told also on the radio that he’s complaining about his tyres but I think he made it quite safely to the end. Bottas leads the championship after round one with 26 points, Hamilton is second with 18 while Vettel is fourth with 12 on the board.